Navigate: Browse Our Films / Politics and Current Events / War & Militarism / Militainment, Inc.
Militainment, Inc. offers a fascinating, disturbing, and timely glimpse into the militarization of American popular culture, examining how U.S. news coverage has come to resemble Hollywood film, video games, and "reality television" in its glamorization of war. Mobilizing an astonishing range of media examples -- from news anchors' idolatry of military machinery to the impact of government propaganda on war reporting -- the film asks: How has war taken its place in the culture as an entertainment spectacle? And how does presenting war as entertainment affect the ability of citizens to evaluate the necessity and real human costs of military action? The film is broken down into nine sections, each between 10 and 20 minutes in length, allowing for in-depth classroom analysis of individual elements of this wide-ranging phenomenon. Roger Stahl is Assistant Professor of Speech Communication at the University of Georgia. His work has appeared in publications such as Rhetoric and Public Affairs, Encyclopedia of Political Communication, and Critical Studies in Media Communication. "Highly recommended, especially for courses on mass communications and popular culture." "Roger Stahl's Militainment is a real eye-opener. 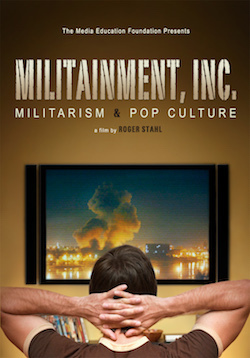 In a highly engaging and well-documented film, Stahl shows how the media have largely functioned as instruments of propaganda in recent U.S. military interventions, and he documents as well the culture of militarism in popular entertainment, ranging from TV shows, sports, and toys, to video games, all of which present war as entertainment. This development is both shocking and dangerous and contributes to a militarization of our culture and society that makes us more likely to go to war, despite our traumatic experiences in Iraq (and now Afghanistan). Every citizen should awaken to these dangers and Stahl's documentary is an important tool of enlightenment that should be widely used in the classroom and public spaces."